Previously, we covered the invention of Dr. John Gorrie, the innovation of Willis Carrier, and the integration of cooling systems into movie theaters across America. But the story of air conditioning doesn’t end in the 1920s. Join us as we continue our look at the history of air conditioning and when you are in need of AC repair, call Tippetts Mechanical! We have years of experience that will help you keep your cool. Although Carrier’s centrifugal chiller design made cooling systems more reliable and more affordable for businesses, there were two hurdles blocking its transition into households in the late 1920s; its size was simply too big and it was far too expensive for most families to afford. It was at this point in 1929 that Frigidaire developed a split-system room cooler, which was much smaller, designed specifically for home use and shaped like a radio cabinet. While it was a more reasonable size, it was very expensive, incredibly heavy, and required a separate, remotely controlled condensing unit in order to operate. An engineer from General Electric, Frank Faust, worked to improve this design and developed a self-contained room cooler. General Electric would go on to produce 32 prototypes based on Faust’s design from 1930 to 1931. While this was happening, a trio at General Motors — Thomas Midgley, Albert Henne, and Robert McNary — were able to synthesize chlorofluorocarbon (CFC) coolants. This was massive, as it was the first non-flammable refrigerating fluid, making air conditioners significantly safer for the mass market. CFC coolants may have been revolutionary at the time, but they were later connected to depletion of the ozone, eventually being phased out worldwide thanks to the Montreal Protocol in the early 1990’s. Hydrofluorocarbons (HFCs), while they do not destroy the ozone, became more popular but were similarly linked to climate change issues. H.H. Schultz and J.Q. Sherman continued the effort to make home cooling systems small enough to be feasible for home use, going on to file a patent for an AC unit that would fit on a window ledge. While they hit the market in 1932, the units undersold because they were still too expensive for most families to afford while in the midst of the Great Depression. It wasn’t until engineer Henry Galson developed a more compact and affordable variant of the window air conditioner that it became a realistic possibility. Thanks to multiple manufacturers having production lines to put together these new units, 43,000 systems were sold by 1947. Home cooling was now in reach for many households, without having to purchase expensive upgrades. When the late 1960s rolled around, nearly all new homes had central air conditioning as a standard. For older homes, window units were the most affordable they had ever been, which made the prospect of living in hot-weather states like Nevada and Florida an easier sell than it had been, leading to a big bump in their population. As of today, nearly 100 million homes in America have air conditioning, which covers about 87 percent of all American households. With the booming popularity of air conditioning in the 1970s going strong, it seemed like smooth sailing ahead. That is, until the energy crisis struck. Lawmakers began work on reducing energy consumption across the board, eventually leading to the Department of Energy’s Appliance and Equipment Standards Program. 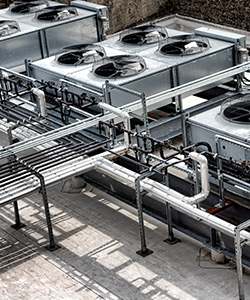 This program sought to instill an overriding federal energy efficiency standard for air conditioning manufacturers nationwide, instead of the hodgepodge of state-specific standards that had been in place previously. Beginning in 1992, further conservation standards were issued to manufacturers of residential central air conditioners and heat pumps by the Energy Department. That initial standard is projected to result in nearly $29 billion in energy savings from 1993 to 2023, while another standard passed in 2006 is expected to have about $70 billion in savings from 2006 to 2035. Additionally, that newest standard is projected to reduce carbon dioxide emissions by 369 million metric tons, which can translate to the annual greenhouse gas emissions of around 72 million cars. As of today, air conditioners use nearly 50 percent less energy than similar units consumed in 1990. While appliance standards will continue to develop and evolve as we learn more about energy consumption, the Department of Energy’s Emerging Technologies Program works to make air conditioning more energy efficient and sustainable. What is the future of air conditioning? Emerging Technologies is working on non-vapor compression technology, negating the use of environmentally harmful HFCs. Non-vapor compression technology is estimated to cut energy consumption by 50 percent! 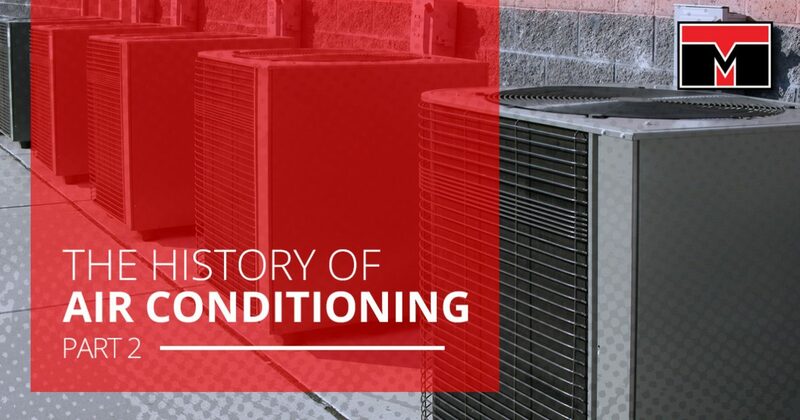 With their continued efforts, the evolution of air conditioning that started all the way back in 1851 shows no signs of slowing down. Air conditioning is one of the most valuable inventions in most people’s everyday lives. It has been a long road to get to where we are now, but the outlook is incredibly positive for future developments moving forward. From Dr. John Gorrie’s initial idea to Willis Carrier working to prevent wrinkling magazine pages, all the way to today, air conditioners are constantly changing to keep everyone cool. The future of air conditioning is sure to be surprising! Respect your air conditioner and treat it right, call Tippetts Mechanical today to schedule routine maintenance, a cleaning, or have a discussion about making your system more energy efficient. Our HVAC gurus have years of experience in cooling and heating systems and will help your family stay comfortable. We hope to hear from you soon!